Love and to be love is arguably the most important element of happiness. Dating and marriage is also one of the essential stages of life. How can we seek out true love? And how can we lead a relationship that is blessed by God? On this topic, we especially invited Pastor Andy Tso from the US to give us a talk. Through his own life experiences and his background in guiding young people over the years, he can definitely help you to understand love and face relationship challenges better. In addition to the main presentation, he will also be available for a questions and answers session. 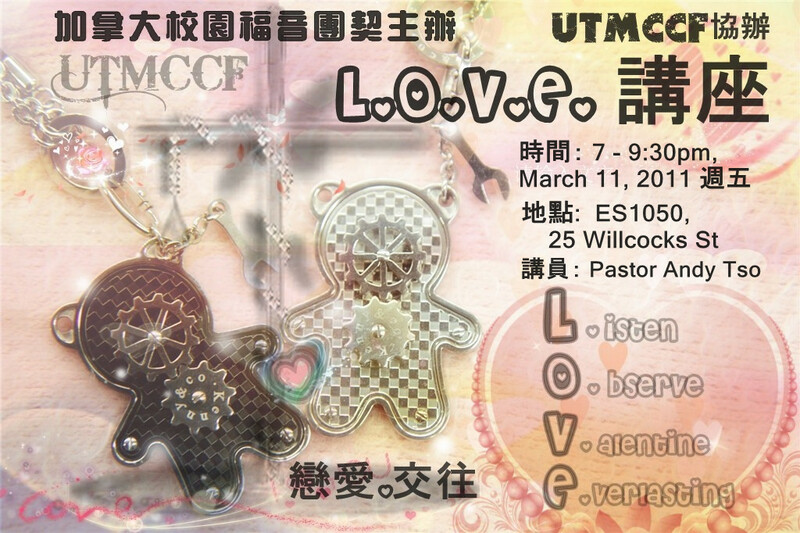 Hope you won’t miss out on this wonderful opportunity to learn about the true love from above. The location of the seminar is the auditorium in the Earth Sciences Building, ES1050. Please check the attached campus map for the exact location. If you have any questions on the day of, please feel free to call the contacts below. On the day of the event, we will be showcasing in the lobby books regarding the topic of the seminar in addition to general Bible study materials. If you think you might be interested, please prepare some money in advance.